New research provides the first detailed genetic picture of an evolutionary war between Streptococcus pneumoniae bacteria and the vaccines and antibiotics used against it over recent decades. 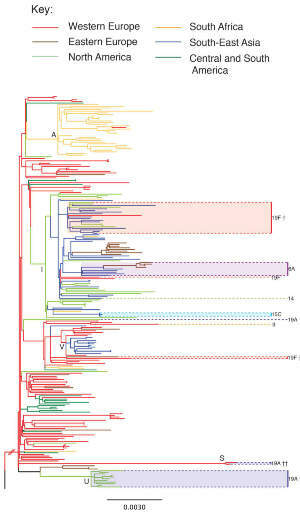 Large-scale genome sequencing reveals patterns of adaptation and the spread of a drug-resistant lineage of the S. pneumoniae bacteria. Global phylogeny of PMEN1. The maximum likelihood tree, constructed using substitutions outside of recombination events, is coloured according to location, as reconstructed through the phylogeny using parsimony. Shaded boxes and dashed lines indicate isolates that have switched capsule type from the ancestral 23F serotype. Specific clades referred to in the text are marked on the tree: ‘A’ (South Africa), ‘I’ (International), ‘V’ (Vietnam), ‘S’ (Spain 19A) and ‘U’ (USA 19A). The study unmasks the genetic events by which bacteria such as S. pneumoniae respond rapidly to new antibiotics and vaccines. The team suggest that knowing the enemy better could improve infection control measures. S. pneumoniae is responsible for a broad range of human diseases, including pneumonia, ear infection and bacterial meningitis. Since the 1970s, some forms of the bacteria have gained resistance to many of the antibiotics traditionally used to treat the disease. In 2000 S. pneumoniae was responsible for 15 million cases of invasive disease across the globe. A new vaccine was introduced to the US in 2000 in an attempt to control disease resulting from the most common and drug resistant forms of the bacteria. The new research uses DNA sequencing to precisely describe the recent evolution and success of a drug-resistant lineage of the bacteria called PMEN1 that has spread successfully to all continents. The power of next-generation sequencing exposes S. pneumoniae as a pathogen that evolves and reinvents itself with remarkable speed. The degree of diversity was a real surprise in such seemingly closely related organisms. First, the team had to distinguish between single letter mutations that are passed down ‘vertically’ when cells divide in two, and so-called ‘horizontal’ changes – called recombinations – where chunks of DNA letters are passed across from one bacterium to another and swapped over, changing the structure of their genomes. The team also use their tree to trace the origin of PMEN1 to Europe, and suggest that the lineage may have been introduced to the Americas and Asia on multiple occasions. The ‘vertical’ mutations, however, could not fully account for the evolution and adaptability of this pathogen. The team found that the ‘horizontal’ transfer of DNA had affected three-quarters of the S. pneumoniae genome. The team also found hotspots – areas of the genome that are particularly affected by horizontal transmission. “We found that genes for antigens – the molecules that trigger our immune response – were particularly prone to this kind of change,” says Dr William Hanage, Associate Professor of Epidemiology at Harvard School of Public Health, and a Visiting Reader at Imperial College London, where he devised the study with scientists at the Wellcome Trust Sanger Institute. “The remarkable amount of variation at these hotspots hints at ways S. pneumoniae can evade vaccines against these antigens. The authors also identify differences in the patterns of adaptation in response to antibiotics and vaccines. While the latest vaccination measures in the USA have almost completely removed the target pneumococcal strains from the population, the pathogen has deep resources to draw on in response. The research suggests that variants that allowed some bacteria to escape the new vaccine were present before the vaccine was introduced. These variants then flourished, expanding to fill a ‘gap in the market’ as the grip of the dominant strain was weakened through vaccination. The researchers suggest that the study provides important new clues into the genetic adaptability of bacteria like S. pneumoniae. They suggest that further focused sequencing programs may prove crucial to the future control of this, and other, bacterial pathogens that use similar mechanisms to outsmart human control measures.